A mobile web app that helps dairy nutrition professionals improve the performance of fatty acids in their dairy cattle diets. The composition of your present fat source has changed dramatically. 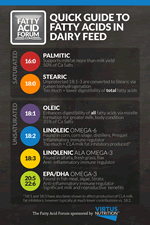 Each fatty acid has specific roles in the dairy cow and the balance of these fatty acids plays a tremendous role in milk and milk fat production, reproduction and the immune status of the animal. This guide provides an overview of the basics on the main fatty acids in dairy cow diets and the roles that they play, as well as an easy reference of how these fatty acids flow from the rumen to the small intestine, and the impacts of biohydrogenation on actual fatty acids utilized by the cow. Save this mobile page to your home screen for easy access at any time! Prequel, a calcium salt of fatty acid supplement with Omega-6s, is fed at ¼ lb. feeding rate for 21 days pre-fresh in order to boost omega-6 levels during that critical transition period. 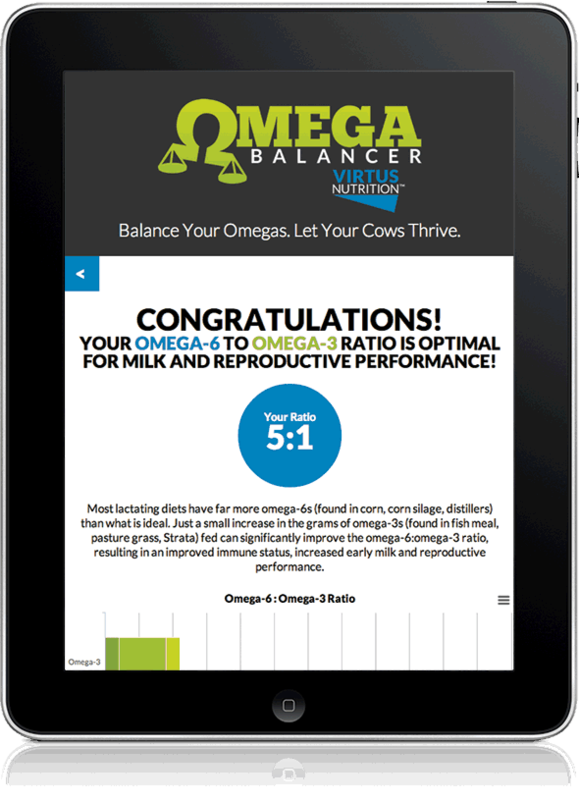 High in EPA/DHA Omega-3s, Strata significantly improves the omega ratio in lactating diets, delivering more milk and improved reproductive performance. Feed Strata up to .4 pounds in the fresh pen and .25 pounds in the early breeding pens to give your cows a fresh start with omega balanced diets. EnerGII is an American-made calcium salt of fatty acids that increases energy for milk production and improves body condition by boosting long chain fatty acid absorption in the small intestine. Effect on Lactation and Digestibility – Canale, et. al. Effect on PGF2a and Folicle Development – Lucy, et., al. NEL of CA on LCFAs – Andrew, et. al. Reproductive Responses to CA Salts of LCFA – Staples, et. al. Effect of Fat Additions to Diets of Dairy Cattle on Milk Production and Components: A Meta-Analysis and Meta-Regression – Lean, et. al. Impacts of Dietary Fat Level and Saturation When Feeding Distillers Grains to High Producing Dairy Cows – Havlin, et. al. Fatty Acids and Reproduction – Mattos, et. al. Fatty Acids for Fertility – Staples, et. al. Immune Response During Transition – Lessard, et. al. Oocyte Quality & Follicle Development – Bilby, et. al. The Role of Specific Fatty Acids on Dairy Cattle Performance and Fertility – Santos, et. al. Effects on Milk Yield, Metabolic Responses – Moussavi, et. al. Effects on Ovarian and Uterine Responses – Moussavi, et. al. Fatty Acids and Transition – Santos, et. al. Omega-3s and Reproduction 1 – Bilby, et. al. Omega-3s and Reproduction II – Bilby, et. al. Omega-3s and Reproduction III – Bilby, et. al.